I felt so well taken care of at this office! Dr. Chan explained everything to me and made sure I understoodwhat she was going to be doing which put me at ease. All of the staff was very kind and welcoming. The front desk receptionist was very helpful and helped me schedule my future appointments. I felt so well taken care of at this office! Dr. Chan explained everything to me and made sure I understood what she was going to be doing which put meat ease. All of the staff was very kind and welcoming. The front desk receptionist was very helpful and helped me schedule my future appointments. Amazing doctor!!! I was very impressed, kind, knowledgeable and very professional !!! Would definitely recommend Dr.Chan to everyone I know !!! Amazing doctor!!! I was very impressed, kind, knowledgeable and very professional !!! Would definitely recommend Dr. Chan to everyone I know !!! Dr. Kimberly Chan graduated from University of Illinois at Champaign/Urbana with degrees in Bioengineering and Materials Science and Engineering- Biomaterials. She persued her doctorate degree at University of Illinois at Chicago. 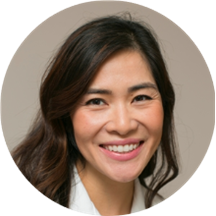 During her dental training, Dr. Chan was reconized with various awards including the Dr.Gerson/Gould Memorial Scholarship highlighting her clinical achievement and a Leadership Excellence Award. She values the time that she spends communicating with her patients and getting to know them. Her goal is to ensure that her patients feel comfortable and understand 100% of the treatment. She utilizes a conservative treatment philosophy, and strives to educate and promote oral health for all her patients. Great dentist. They get to the point and are very transparent with your dental issues. Very clear. My favorite dentist! She is very friendly and caring and explains everything in detail. The office assistant is also friendly and even texted me back on the day the office was closed. So glad I found this office! Kimberly was great! She told me the work I needed to get done but did not pressure me to do it all at once and spend loads of money. She put together a reasonable work plan that allows it to beaffordable while prioritizing the work I need done now for the health of my teeth. Dr. Chan and Natalie (who did my cleaning) were very knowledgeable and provided me with tips on better brushing and flossing. Overall I am beyond satisfied and happy to have found such a great team!! Dr. Chen was very thorough and attentive to my dental needs, She is very personable and easy to talk to. Her office staff is very friendly and accommodating. Great experience, got a normal checkup and clean as well as a cavity and chipped tooth filled. Both experiences were great. She made me feel comfortable and was understanding of the type of patient I am and made me feel confident to return. I have fantastic oral hygiene and have had regular dental cleaning my whole life. My mouth was seriously sore for a week after my cleaning and exam here. The hygienist was extremely rough and weirdly lectured me for a long timeabout oral health despite me having no cavities or issues. The receptionist didnt have my paperwork ready despite me filling it out ahead of time and they actually ignored me for quite some time when I came in. It was just really unpleasant. Dr. Chan and all staff are very kind, patient, and willing to take the time to explain everything and answer questions. Dr. Chan was great!! She genuinely cared and gave her recommendation on what I needed done instead of doing what I had originally asked. I had an old chipped tooth that a dentist tried to fix and a new one Icame to see her for - she did an amazing job and they look better than they did before the chips!! Dr. Chan’s office has been excellent. All staff members were friendly, I was seen immediately, and everything was explained clearly. While dental work is not something I look forward to, working with this office is certainly making it a more pleasant experience. Very nice, and clearly explained everything that was happening and why certain things were done. They took 45mins after they gave anesthesia to start my filling work. office lady was so rude to us. Dr. Chan and her staff were kind, patient, and thorough – they explained everything they were doing as they were doing it, and made the experience painless! The dentist hygienist was very thorough (my cleaning was over an hour) which was nice but messed with my scheduling of the day. I ended up being in the office from 850-1050 for a teeth cleaning which seemed a little excessive. Dr. Chan is excellent! She is very friendly, very helpful, and made my experience very worthwhile. She is highly skilled and I will definitely go back. She was really friendly and informative! The hygienist was also very nice and would tell me everything she was doing in detail. Dr. Chan is awesome! She caught an ongoing problem that my previous dentist failed to notice. She's very attentive and thorough when working on my teeth and she made sure I felt comfortable all throughout my appointment and that I wasn'toverwhelmed. Hands down the best dentist I've ever been to! Dr. Chan has been open, honest, and very very sweet to me about my plethora of dental problems. I almost look forward to seeing her for my next appointment. Older office, but clean with free parking behind it. 5 stars! Dr. Chan was very knowledgeable and took the time to explain everything thoroughly. All of the staff was very friendly, all my questions were answered and worries put to rest. Dr. Chan and her hygienist, Giselle, were thorough and helpful. Dr. Chan was generous in offering various treatment options into single appointments to help accommodate my schedule. Both were great about telling me what they were doing, answeringmy questions, and being concerned about my comfort. The office environment leaves a bit to be desired, but the service does not. Will be returning shortly for removal of wisdom teeth. Dr. Chan was very thorough. She made me feel positive about my dental health and helped me come up with a yearlong plan to get to optimum oral health :) I am very satisfied. Her Dental Hygienist was remarkable and wentabove and beyond for me, helping me through parts of the appointment that made me anxious. Excellent Dentist. We are sort of new to the area. Took my daughter for a cleaning and they cleaned her teeth very thorough and took the extra time to show her how to floss where her permanent retainers are. After thatvisit, I am making appointments for the rest of the family. Dr. Chan is the best. We found our family dentist. I hadn't been to the dentist in a loooooong time, but Dr. Chan and the rest of the staff made me feel extremely comfortable. I can't recommend them enough. This was my first visit to the office and it was a pleasant experience before I even set foot in the door. Dr.Chan was expected to be out of the office the day I scheduled so I got a courtesy calla few days beforehand informing me of this and asking if I was okay with being seen by her associate, Dr. Tsai. The receptionist was pleasant, friendly and very helpful with my insurance questions. The dental assistant was also friendly and Dr. Tsai was thorough and eager to answer any questions I had. I loved my first visit! I called ahead of time to ask a question about paperwork and the receptionist was very pleasant. When I arrived at my appointment, I was greeted with a warm smile and handshake from the receptionist. Ionly had a picture of my insurance card and the receptionist was more than happy to help me get everything situated with that. The dental hygienist that worked with me was amazing. She was kind, understanding, upbeat, patient, attentive, and made my visit one of the best I've had at any dentist office! I highly recommend this practice and I am so happy I found them myself! Everyone at the office is excellent. they have Saturday hours, which works best for me. Very easy to make an appointment. They are very nice (especially with a fearful patient like me!) Definitely will go back. After being without insurance for over a decade, I had a LOT of problems that needed fixing. Dr Chan and her staff helped me set up a treatment plan, prioritize issues, referred me to a GREAT oral surgeon and endodontist, andspent a year taking care of the problems with my mouth. Everyone is very professional and kind and helped find solutions that suited my insurance plan and my budget. I'm very happy with Dr. Chan and her office and glad I found her. I have a high level of dental anxiety and have had extremely bad experiences with dentists. Dr. Chan, however, is fantastic. Also her practice is easy to get to via bus. Parking is street parking. It's across the street from a Walgreens if you have a prescription that needs filling. The visit with Dr. Chan was good -- but her colleagues leave much to be desired, especially the front desk attendant, who I found to be kinda pushy, and borderline rude when contacting me to schedule another appointment. I was really comfortable and felt cared for while I was there, and I generally hate going to the dentist. I'll be back. Best dentist and hygienist I've seen. Explained everything as they were doing it, were very polite, and gentle too. Best of all, they fixed my problems. Highly, highly recommend. I walked in right at my appt time and was brought right back and the hygienist started. Only chatted with Dr. Chan for a few minutes but she seemed very knowledgable and gave me good advice on future dental care. Very professional and informative. Love Dr. Chan, but some of her staff could use better bedside, especially introducing themselves. Dr. Chan is very nice & the staff is very professional. They made me comfortable during my dental procedure. Now im considering her to be my primary dentist. I'll be back for sure! Every single person I came into contact with was extremely thorough. Every one of my questions was answered with confidence. I'm very pleased and look forward to completing the work I need done. For someone who does not like going to the dentist, this was my best experience in quite awhile! The receptionist and hygienist were both really friendly and offered suggestions for best brushing practices. Dr. Chan was nice and seemed to genuinelycare about the problems she saw in my teeth. I highly recommend this office! The office is simple with no frills, but the staff is great. The receptionist is very nice and organized. The tech who did my cleaning was very informative and thorough, and the doc took as much time as was needed totalk everything through with me. This is definitely my permanent dentist, and I'll tell everyone I know to go here. Great Dr.! Very friendly, knew her stuff and great staff! In an age where doctors quickly rush their patients out the door, I felt that Dr. Chan and her staff were genuinely concerned for my overall well-being. Dr. Chan and her staff took the time to explain the steps needed toimprove my dental health, and they also made important connections regarding how certain elements of oral health effects my overall health in general. Great to finally have found a great dentist in the city after looking for 2 years!